Theater in the Now: Review: Worthy of Forgiveness? How do we forgive? Can we forgive? Is it in all of us? For some, even after the most horrific tragedies, some are able to find it in their hearts to forgive. For example the family of a young Amish girl gunned down in her single room school. This family invited the family of the gunman to their daughter's funeral. But why? In Nickel Mines, the theme of resiliency and forgiveness are brought to the stage through the events at the West Nickel Mines School. Nickel Mines is like watching experimental theater on the collegiate level. And guess what, it is! Initially beginning at University of California, Irvine, Nickel Mines is an overly indulgent theatrical piece that blends music, dance, and a conceptual “story” in a messy evening under the umbrella of art. With music and lyrics by Dan Dyer and book by Andrew Palermo and Shannon Stoeke, Nickel Mines sets experimental musicals back exponentially. What came first, the idea to explore human resilience through the theme of forgiveness or the tragedy at West Nickel Mines School? Either way, theatrically speaking, the two felt pigeonholed together to complete a thesis that was force-fed into the audiences throats. It tries to play upon emotionally taking advantage with the horrendous real life story but the reality is the action of forgiveness, with little reason for it in the text, makes this particular story perplexing. 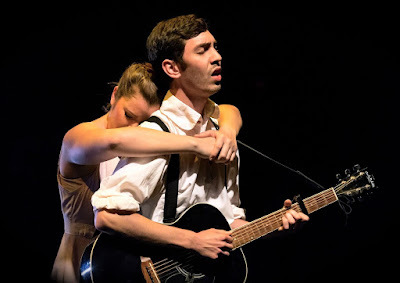 Nickel Mines is not your typical book musical. In fact it's not. At all. There is a focal family at the center of the drama that propels the focus on the aftermath of forgiveness. But the structure does this no service. To be completely honest, it feels as if the research Dyer, Palermo, and Stoeke did was pulled solely from the Wikipedia article. Why is Marian the focal and not the others? The parallels between article and text are unfathomable. This is a painfully under-thought book that is saved by some stunning music. Dyer knows how to write fine folk ditties. But did they all live in the world of the play? That’s debatable. When Dyer tried to incorporate plot-driving lyrics, he seems to be out of his element. To critique the book means that there was a book to critique. Simply looking at the structure of moment to moment, there seemed to be little rhyme or reason for where Palermo and Stoeke stuck their scenes. In fact, the first three moments all felt like they should be they wanted to be the start of the show, fighting against one another. While the majority of the play occurred in the aftermath, linking the past to the present never really happened. Andrew Palermo not only had a co-book writer credit, he took the reigns as director and choreographer. Palermo certainly put his stamp on Nickel Mines. His vision was the only vision present. Palermo implemented contemporary movement with conceptualized text to create a prodigiously chaotic style. Did it serve the source material properly? Nah. There was so much thrown on stage that likely made more sense in his head. When execution tears down a show they way Palermo executed Nickel Mines, it’s bothersome. Calling Nickel Mines a work in progress is generous. Nickel Mines is a dark subject matter for a musical. Finding the light is possible in any story. It just has to be tastefully done. This didn’t quite do so. Theater is up for interpretation. But some stories shouldn’t be interpreted.